The NED was established by the Reagan administration after the CIA’s role in covertly funding efforts to overthrow foreign governments was brought to light, leading to the discrediting of the parties, movements, journals, books, newspapers and individuals that received CIA funding. This undermined the efficacy of these agents as tools of US foreign policy. “There also were slaves, usually domestic servants, who owned nothing. Their offspring were born into slavery. The majority of the rural population were serfs. Treated little better than slaves, the serfs went without schooling or medical care, They were under a lifetime bond to work the lord’s land–or the monastery’s land–without pay, to repair the lord’s houses, transport his crops, and collect his firewood. They were also expected to provide carrying animals and transportation on demand. Their masters told them what crops to grow and what animals to raise. They could not get married without the consent of their lord or lama. And they might easily be separated from their families should their owners lease them out to work in a distant location. 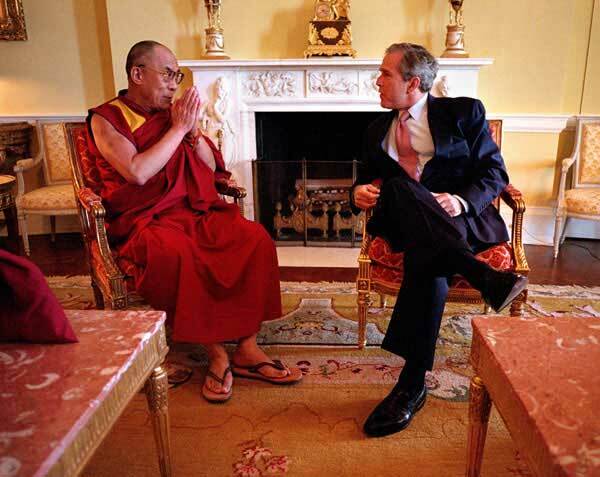 The NED calls the former feudal overlord, the Dalai Lama, seen here with George W. Bush, “a devoted democrat.” The slaves and serfs of the old Tibet might disagree. In the same press release, the NED urged the Obama administration “to express America’s strong support for him” (a “devoted democrat”) “and what he represents – genuine autonomy for the Tibetan people.”  But why should the NED urge the US administration to express support for autonomy in Tibet, when Washington has never supported autonomy for the Basques, Corsicans, the Kurds in Turkey, the Scots and Irish nationalists, or the South Ossetians? Weber’s defense of the NED comes in response to a call from Shika Dalmia, a senior analyst at the Reason Foundation, urging the Obama administration to cut funding to the NED on grounds the organization has outlived its original mandate, overthrowing communism. Hell on earth? Is this like the hell on earth that is a ghetto in the hyper-nuclear-armed United States, or the hell on earth that is the Gaza blockaded by a nuclear-armed Israel backed by the hyper-nuclear-armed Pentagon? As a member of the US foreign policy establishment, Weber ought to be careful about talking of hell on earth, for Washington is among the principal authors of unnecessary torment in this world. Iraq, site of the greatest contemporary humanitarian catastrophe, is a hell on earth, and it was created by the United States, for reasons that have nothing whatever to do with what Washington said motivated the country’s Iraq sanctions policy and invasion. What did US B52 bombers create in Vietnam, Laos and Cambodia if not hell on earth? And what condition prevailed after the atomic bombings of Hiroshima, and Nagasaki, and the fire-bombing of Dresden? Hell on earth in north Korea didn’t begin with the US demolishing every building over one-story, but it did nothing to relieve it. The torment didn’t end either when Washington practiced nuclear terrorism by deploying battlefield nuclear weapons on the Korean peninsula or when in 1993 it announced it was targeting strategic nuclear missiles on north Korea, a country which, at the time, had no nuclear weapons. The NED’s role in overthrowing communism played its own part in creating hell on earth in north Korea by bringing about the collapse of the country’s markets. Decades-long sanctions have also made life tougher, precisely as intended by US policy makers. And unremitting military pressure from the United States, a military behemoth, has forced north Korea, a military pipsqueak, to channel a punishingly high percentage of its meagre resources into self-defense, depriving the country of the capital it needs for productive investment. If there is a hell on earth in north Korea, it exists because the United States has created one, deliberately, systematically, and with the intention of crushing a top-to-bottom alternative to Third World dependency on the United States. Meanwhile, the NED has celebrated Jestina Mukoko, a Zimbabwean who was arrested in December 2008 by Zimbabwe state security agents, who Mukuko claims tortured her. Mukoko is variously connected in leadership roles with organizations funded by the NED and United State Agency for International Development (USAID.) She is, for example, “the executive director of the Zimbabwe Peace Project, a grantee of the” NED , as well as a member of the board of the Zimbabwe Election Support Network, an organization interlocked with a number of other Western-funded anti-Mugabe groups, and which receives its funding from the NED and USAID. 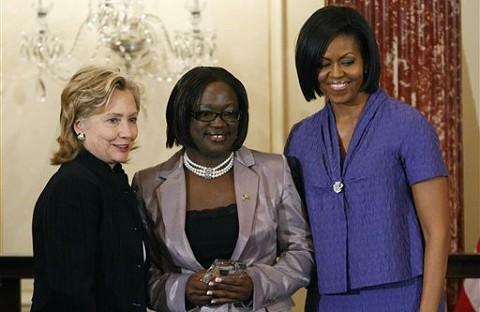 Jestina Mukoko, center, feted in Washington for her role as a US government-funded regime change agent. Honored by US Secretary of State Hilary Clinton and US First Lady Michelle Obama for services to the empire. To understand why Mukoko was arrested, it helps to place her activities in the context of the Mugabe government’s efforts to carry through land reform, the West’s opposition to the expropriation of white settler farmland, and the efforts of the United States to enforce respect for private property rights through a campaign of regime change in which Mukoko plays a role. 2. The US-sponsored regime change campaign operates through the NED and USAID-financing of domestic activists, like Mukoko. 3. While the ostensible objective of NED and USAID-sponsored activities in Zimbabwe is the promotion of democracy and human rights, the real aim is the installation of a government committed to facilitating the pursuit of US and Western interests, including allowing the sale of agricultural land to foreign investors. That the United States and its foundations have the slightest concern for promoting democracy and human rights is belied by the US practices of detaining people without charge in secret prisons, the scandals of Abu Ghraib, Bagram and Guantanamo, the furnishing of aid and support to such notorious autocracies as Egypt and Saudi Arabia, and the backing of the Israeli blockade of Gaza to punish Gazans for exercising their democratic rights in electing Hamas. The NED does, however, care deeply about the interests of US corporations, banks and investors which, after all, play the dominant role in shaping US policy and whose representatives staff the key positions of the US state. In other words, Mukoko is deeply connected to a US state which is openly hostile to Zimbabwe and its land reform and economic indigenization programs, and seeks to oust the Zanu-PF element of the current government. Is it any wonder she has drawn the attention of the Zimbabwe’s security services? This mercenary on behalf of US interests recently travelled to Washington where she was feted by US Secretary of State Hilary Clinton and US First Lady Michelle Obama, an act not too much different from Petain traveling to Berlin to be showered with honors by Ribbentrop and Eva Braun. What would the US security state do to a US-based jihadist who took money from a foundation financed by the Iranian government to promote the rise of an Islamic Republic in the United States and who would later travel to Tehran to be personally presented with official honors by Mabouchehr Mottaki, the Iranian foreign minister? At the ceremony honouring Mukoko’s services to the empire, Michelle Obama expressed shock that Mukoko “was interrogated (by Zimbabwe security agents) for hours while forced to kneel on gravel…”  This was precious, coming from the wife of a president whose country has spent the last decade kidnapping militants who oppose their southwest Asian countries being dominated by the United States and its corrupt puppet regimes and then subjecting them to stress positions, water-boarding and other “enhanced” interrogation techniques, when they’re not being shipped off to allied countries to face more unrestrained forms of torture, or are simply being assassinated. Belaboring the Eva Braun analogy, Obama’s shock was like Hitler’s partner complaining about the Soviets exchanging territory with Finland by force, long after the Nazis had gone on their rampage through Europe. …a disparity all too evident in the NED’s public pronouncements. Vin Weber, “Vin Weber: Defending the well-endowed,” The Washington Times, March 11, 2010. David K. Shipler, “Missionaries for Democracy: U.S. Aid for Global Pluralism,” The New York Times, June 1, 1986. John M. Broder, “Political Meddling by Outsiders: Not New for U.S.,” The New York Times, April 1, 1997. National Endowment for Democracy, “How to welcome the Dalai Lama to Washington,” February 16, 2010. Shikha Dalmia, “Busting the well-endowed,” The Washington Times, March 4, 2010. Michael Allen, “Activist demands accountability and end to impunity in Zimbabwe,” Democracy Digest, March 12, 2010.